ShekinahToday 7th November, 2012: An Iconic Shrine, in the heart of India’s booming Mumbai has called for international outcry to condemn the move of banning women visiting the century old Shrine of Pir Haji Ali Shah Bukhari. The decision of barring woman to visit the tomb inside where Saint Pir Haji Ali Shah Bukhari is buried has caused outrage and criticism on twitter and women rights groups across the world. 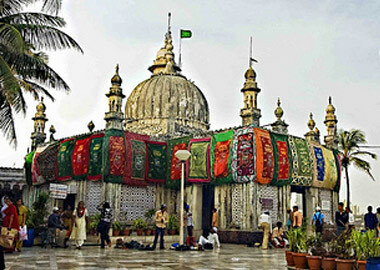 Haji Ali Dargah is a famous site where thousands of pilgrims pay respects to Pir Haji Ali Shah. The faithful touch the grave and spread flowers and say prayers but due to the recent ban women are denied access to the inner parts of the shrine. According to an India Times report, a Sunni Cleric said the move has purely been enforced to be in line with Sharia Law. “The Shariah Law does not allow intermingling of men and women at any place”. The cleric said. Seven other Dargahs in Mumbai have placed ban on women visiting the inner parts of tomb which has caused concerns that it will further spread to other parts of the religious sites. Shahid Khan, a minority rights activist, condemned the recent move of barring women to enter inner parts of Dargah in India. Speaking to ShekinahToday he further added that women have rights to exercise their religious duties and called in for concerned authorities to uplift the ban so that women can live their lives according to their religious beliefs. According to the Pew Research Centre in 2011, there are around 10.9% of world’s Muslims living in India. This entry was posted in News and tagged blog, Christian, christian blog, christian news blog, Christian persecution, India, Injustice, International News, minorities, minority, Persecution, Report, Shekinah, society, South asia. Bookmark the permalink.